Cycle fixed: Distance: 55.6mi, time: 03:27:33, pace: 3:44min/mi, speed: 16.1mi/h. On 42×16. On low rolling lands and light wind you can find perfect single-speed bike conditions. Even the hills don’t seem as intimidating as on a windy day. Tendonitus flared up yesterday during a long drive. It does seem to get aggravated by long periods of sitting still. Three and a half hours of cycling has soothed most of it away. Odd how that happens. 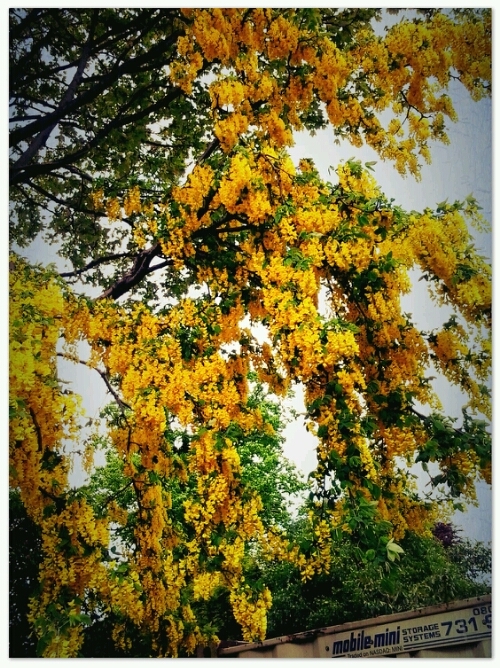 This Laburnum at work is in full bloom, whereas mine at home shows no yellow at all. Perhaps view are different varieties. I know not. This entry was posted in Cycling, Health and tagged Cycling, fixed gear, tendonitus. Bookmark the permalink.